Michael Bay brings us another dose of giant robot action in his fifth entry to the Transformers cinematic canon; Transformers: The Last Knight. Anyone who has seen any of these movies before this one will know the drill. Nothing about this is any different nor is there any real desire to reinvent what has come before. Michael Bay’s formula is proven in the sense that it makes money so there is no real appetite to make any changes. I suspect that would change should this one prove to be a flop but I don’t think that will happen. The usual checklist of criticisms lobbied at the other movies can be found here too. It’s too long, peppered with casual racism, sexism and terrible jokes, the story is needlessly complicated and everything explodes when hit by a weak gust of wind. I won’t labour those criticisms because the same problems exist in all of these. If they are a deal breaker then my guess is that you’ll have abandoned the franchise fairly early on so there’s no real point in focusing on these too much. One thing I will talk a bit about is the story such as it is. The plot this time out is as messy as usual but there are a couple of threads that are interesting. I really like the idea that the authorities -certainly in the United States- have had enough of giant robots causing untold property damage and have made it clear that Transformers are no longer welcome. The returning Cade Yeager (Mark Wahlberg) offers a safe haven for Autobots in his junk yard which naturally has him labelled as a fugitive. This story thread is actually really interesting because it ties into the xenophobic tendencies that are cropping up in our world today so could have been used as a commentary on how ridiculous it is to persecute those who are clearly innocent if given any rational thought. Sadly this is just a small part of everything else is going on and only really serves as a way to have Cade enter the story while catching the audience up with what he has been up to since the last film. The main thrust of the story involves making alterations to history. It turns out that the Arthurian Myth is completely true but all the talk of Merlin’s magic and Dragons comes from the Transformers influencing this. There’s also a small thread about Bumblebee serving in World War II that doesn’t make sense for all sorts of reasons. Essentially nobody is interesting in paying attention to the limp continuity between the films. Arthurian Legend is the driving force for what this film calls a story in that there’s a prophecy and a long line of Merlin’s descendants that becomes more convoluted as the film progresses thanks to some really painful exposition by Sir Edmund Burton (Anthony Hopkins) and his robot Butler Cogman (Jim Carter). It’s not worth thinking too much about because all it does is enable the action sequences. As with the other films the action sequences vary in quality. Some of them are beautifully shot and choreographed with a handful of genuine standout moments towards the end where others are clumsy and confusing. This may be a personal thing but there’s I generally feel desensitised to this particular brand of action. I was really impressed by the first and third films in how the action was delivered but that “Wow factor” has long since gone after seeing five of these films along with many other similar explosive finale blockbusters. It could also have something to do with the fact that it’s difficult to invest in those involved in the action sequences as the characters are paper thin. 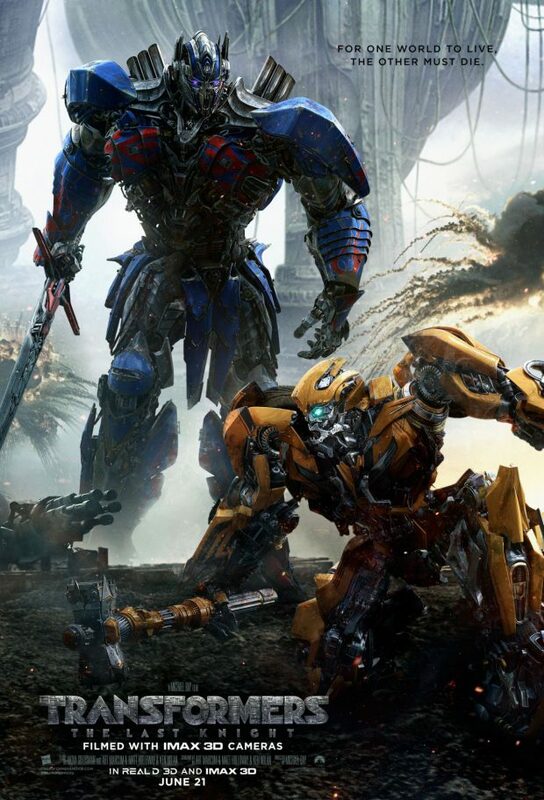 Even franchise mainstays like Optimus Prime (Peter Cullen) and Bumblebee (Erik Aadahl) feel like they are part of the many moving parts without any real characterisation behind them. Optimus Prime’s epic voice delivering speeches aren’t enough to disguise that fact. Cade is probably the strongest of the characters as he is initially shown to have a compassionate streak when it comes to Transformers or wayward stray humans. His main hang up is that he misses his daughter and regrets the fact that his fugitive status means that he can’t interact with his absent daughter. Other times he comes across as obnoxious so it’s a mixed bag really. His love interest, Vivian Wembley (Laura Haddock) is completely bereft of anything resembling personality. She’s aggressive towards Cade to promote an obvious attraction between them and constantly reminds him -and the audience- of how intelligent she is despite being dressed and shot like any other girl in a Michael Bay movie. She is almost the living embodiment of the sexism he routinely displays and there’s nothing interesting about the character at all. One character that had a lot of potential was Izabella (Isabella Moner); a young orphan girl who calls a Transformer her family. If this film had been a more intimate story about her then I think it would have been a lot better as the idea of an orphaned girl surviving on her wits with robot companions sounds like a really cool idea. She fades into the background after a while and is all but forgotten by the time the film ends. There are more than just references to the earlier films in the franchise thanks to the returning Colonel William Lennox (Josh Duhamel). He was a character I liked in the previous films and he has plenty to do here though gets lost in the white noise just as everyone else does. John Turturro also returns but the less said about that the better. Despite what I’ve said here; if you’ve watched and enjoyed the other films then you’ll know exactly what you’re getting here. There’s an attempt to make the whole thing bigger in scope and adding a dose of mythology to the plot is a reasonable idea. The execution of this varies but there have been five of these films now with more definitely to come so at least it can be said that the standard is more or less consistent by this point. There are pockets of competence throughout this film in the action and visuals with other aspects being a muddled mess and there is potential in some of the characters that starts to shine through. Basically, if you found some enjoyment in the others then go see this one and if not then avoid like the plague.